●Unlocking the doors using the smart key system may not be possible immediately after reconnecting the battery. If this happens, use the wireless remote control or the mechanical key to lock/unlock the doors. ●Start the engine with the “ENGINE START STOP” switch in ACCESSORY mode. The engine may not start with the “ENGINE START STOP” switch turned off. However, the engine will operate normally from the second attempt. ●The “ENGINE START STOP” switch mode is recorded by the vehicle. If the battery is reconnected, the vehicle will return the “ENGINE START STOP” switch mode to the status it was in before the battery was disconnected. Make sure to turn off the engine before disconnect the battery. Take extra care when connecting the battery if the “ENGINE START STOP” switch mode prior to discharge is unknown. 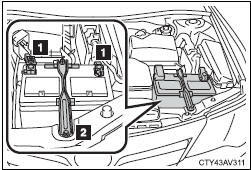 If the engine will not start even after multiple attempts, contact your Toyota dealer. ■Where to safely charge the battery Always charge the battery in an open area. Do not charge the battery in a garage or closed room where there is insufficient ventilation. ■How to recharge the battery Only perform a slow charge (5 A or less). The battery may explode if charged at a quicker rate. ■Emergency measures regarding electrolyte ●If electrolyte gets in your eyes Flush your eyes with clean water for at least 15 minutes and get immediate medical attention. If possible, continue to apply water with a sponge or cloth while traveling to the nearest medical facility. ●If electrolyte gets on your skin Wash the affected area thoroughly. If you feel pain or burning, get medical attention immediately. ●If electrolyte gets on your clothes It can soak through clothing on to your skin. Immediately take off the clothing and follow the procedure above if necessary. ●If you accidentally swallow electrolyte Drink a large quantity of water or milk. Get emergency medical attention immediately. ■When recharging the battery Never recharge the battery while the engine is running. Also, be sure all accessories are turned off.